Master the electrical principles and practices you need to succeed as a professional installation and service technician with this trusted guide. 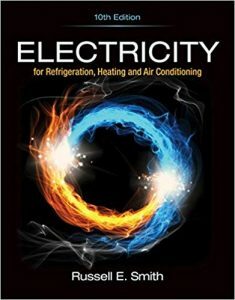 Accurate and easy-to-understand, ELECTRICITY FOR REFRIGERATION, HEATING AND AIR CONDITIONING, Tenth Edition, will give you a strong foundation in essential electrical theory–and help you hone real-world skills and techniques you can apply on the job. Thoroughly updated for today’s professionals, the Tenth Edition includes up-to-date information based on current trends, technology, and industry practices–including key diagnosis and troubleshooting methods–making this an ideal resource whether you’re new to the field or a current practitioner ready to update your knowledge and skills.